As part of my personal challenge to build three Priests more or less concurrently, I acquired two Academy kits: One to build a later early version as may have been seen in Sicily; and the second kit to build "Baboon" of the 2nd Armored Division as it arrived in Normandy with wading trunks and deep water fording walls around the crew compartment. The Italeri kit provided a late Priest as seen in the winter of 1944-45. This 2007 release continued Academy's track record of raising AFV modelers' hopes and then perplexing them with some notable improvements bedeviled by peculiar shortcuts and errors. As Steve Zaloga has noted, it seems that Academy was more inspired by the Italeri Priest than in-depth research. Academy may have felt there was a safe harbor in the fact that many features changed through the production run and made some preemptory decisions that in retrospect were somewhat dubious. 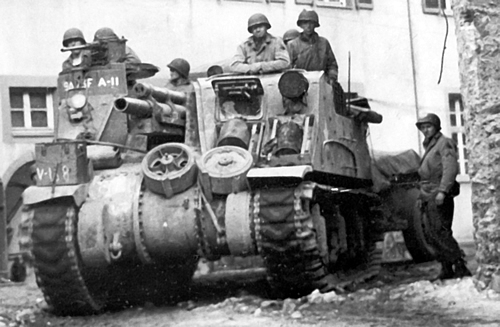 The M7 Priest, based on the M3 Lee chassis, underwent numerous changes during the production run of 3,490 vehicles between the spring of 1942 and spring of 1945. 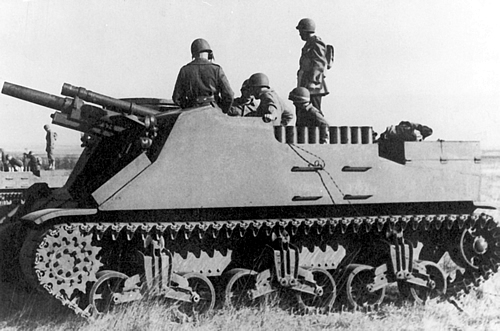 These changes were introduced throughout the manufacturing process, and some vehicles were upgraded during maintenance in the field, so while there are some distinctive "markers" that separate early, mid, and late versions, there are also features that were more fluid in their appearances and may be seen in one mid version M7, but not in another one. For example, after the early version was well into production, the need to raise the side walls to better protect the ammo stored in the bins led to the use of field-manufactured plates being welded on top of the side and rear walls. This feature was introduced in the factory as hinged plates, and is one of the markers of most, but not all, intermediate versions. The hinged plates were standardized on the later Priests. As such, this Priest straddles the ground between early and mid versions. It does not included the notched differential cover, 12-round ammo bins, and brackets mounted on the stowage bins for auxiliary fuel tanks seen on the earliest version. It does not have the welded or hinged plates on the walls. Early side-opening stowage bins mounted on the rear deck continued into the intermediate production variant, but this kit has the later top-opening bins (albeit without the distinctive mesh baskets of the late Priest). The Academy kit does not include the long, rectangular instrument panel that carried over from the M3 Lee into the early Priest, but the panel that is included seems spurious. The early and mid variants were equipped with M1 carbines in the wall-mounted scabbards; Academy includes Garands (as does Italeri, though the late Priest carried Thompson submachine guns). The very earliest Priests had problems with gasoline vapors collecting in the engine compartment. This was alleviated for later early and intermediate vehicles by cutting two rectangles out of the deck plate and covering them with screens and protective armor plates. The Academy kit omits these, a significant error that can be rectified by scratchbuilding, photo etch parts, or loading the deck with gear (which was certainly common, but the gear would sit atop shelves that spanned the vent plates). Pluses with this kit are the early suspension, corrected from the manufacturer's M3 Lee; more detail in the driver's area; and the three-piece differential cover is represented well. The floor has the correct anti-skid pattern. A full complement of fiberboard ammo tubes is included. However, they are shortened in order to fit into the false bottom of the ammo bins, which lack individual dividers. On the down side, there are numerous ejector pin marks to fill. The parts are not cast as crisply as we've enjoyed from other manufacturers. As mentioned, the instrument panel is fantasy, as is an additional seat on the sponson behind the driver. The gun's panoramic telescope is unusual or considerably simplified. The rear overhang wall notched as should be.And the ammo arrangement is disappointing, and there are some fit issues, but nothing that is beyond repair. There are a couple errors in the instructions. That being said, this is a much better basis for building an early or intermediate Priest than trying to backdate the Italeri kit, which for some 20 years was the only recourse and required cannibalizing a Tamiya Lee or Grant to get the early suspension and three-piece differential cover. Now there are a wealth of aftermarket sets, including early suspensions from Tasca, Formations, and Tank Work Shop; extensive photo etch sets from Eduard and Voyager; and 105mm ammo sets from Resicast, Tiger Model Design, and Verlinden. I used the Eduard photoetch set #35446 for the Sicily Priest, and the Voyager set for "Baboon." But be aware that these sets include numerous parts for late-early or intermediate versions, without any explanation of what may or may not be appropriate. Using references can help you sort out the details. 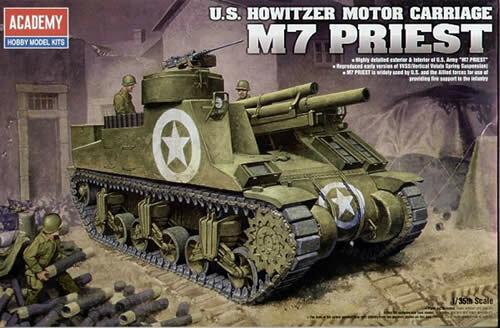 Along with technical manuals and numerous online photos, other references used for this build included Tankograd's excellent U.S. WWII 105mm Howitzer Motor Carriages M7 & M7B1 Priest, Steven Zaloga's U.S. Armored Artillery in World War II, Jim Mesko's U.S. Self-Propelled Guns in Action, (albeit with some errors in the text and photos), Richard Hunnicutt's Sherman, and Chris "Toadman" Hughes' 105mm H.M.C. M7, M7B1, and M7B2 Photo Detail CD. Also available but not sourced are Allied-Axis #17 and Steve Zaloga's article in Military Modeling.